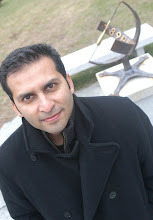 The twin forces of education and technology have interwined to create a new dynamic. Education has raised expectations and broadened world views. Technology—TV, the Internet, omnipresent mobile phones—has armed the young not only with a clear sense of how the rest of the world, particularly China, is changing, but also given them the wherewithal to create a movement that is now reshaping their countries. 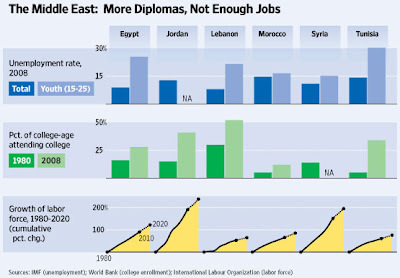 It is easy to see why Tunisia, Egypt, and Lebanon stand out in terms of the unemployment rates amongst the the youths. However, I'm actually surprised at the lower education rates for Morocco. And from this context, the internet usage seems even more amazing (10 million out of a population of 31 million). And while we are on the subject of education, here is an article/interview in the Chronicle of Higher Education (tip from Michael Murray) about Saudi oil company Amarco and its emphasis on education in Saudi Arabia. Yes, yes, if you are a woman there, you may still need somebody to drive you to the university. Q: What are some of the major changes and trends that you expect to see in Saudi education in the next five years? A: There is going to be tremendous growth in capacity in terms of the numbers of seats offered, admissions, and graduates coming out. There is an intent to upgrade the quality. The limitation on upgrading is the faculty. Many Saudi universities have been teaching in Arabic, and that includes both the sciences and humanities. That has been a limitation for graduates looking for jobs in the private sector. Most of the private sector does its business in English. I expect more and more universities to switch. That will have a dual effect. It will allow them to tap a bigger pool of faculty talent globally, because they will be hiring English-speaking faculty, and it will also make their graduates more readily [employable]. I expect there will be a drive to upgrade the quality of education, which means that many universities will try to establish themselves as research universities, so you will see more spending. Women's education, which has been segregated with the exception of Kaust, will slowly start merging with the education of men in some areas. That will be a slow process, but I believe it is necessary, especially in advanced degrees.